As PeopleSoft maintains critical enterprise data, having an audit trail on critical data is of paramount importance. This post will help you setup Record Level Auditing in 7 simple steps. As the name suggests, record level auditing is the auditing mechanism enforced on a Record. To set up record level auditing, follow the steps below. Not all records in PeopleSoft need auditing. When there is such a business requirement, choose the record(s) that needs to be audited. An Audit record doesn’t need key attributes or edits, so remove them. The same rule goes with Related Language Records, Query security records and PeopleCode. Also, remove all other fields that you are not interested in. Just remove them all. Insert the below fields (also known as audit fields) at the top of the new record in the below order. Make them required and mark them as keys. On the Record Field Properties for AUDIT_STAMP, we need to check the Auto-Update checkbox. This is essential to correctly populate the date-time stamp. AUDIT_ACTN can take up any of the below values based on the type of the action performed. C – Row changed (updated), but no key fields changed. K – Row changed (updated), and at least one key field changed. N – Row changed (updated), and at least one key field changed. In case of C and K the system writes old values to the audit table. While for N, the new values are written into the audit table. Your Audit record must be a Database record and you should be able to access it using Query. Open the Base Record that is to be audited. Open its properties. On the Use tab, under the Record Audit, specify the name of the audit record that we just created as the Record Name. Choose Audit Options based on your requirement. Based on the Audit option that you have chosen, perform some transaction that can trigger the audit. Now query the audit record and check for new rows. Try to infer the meaning of each row that got added. A delivered page to test this is the Department page. 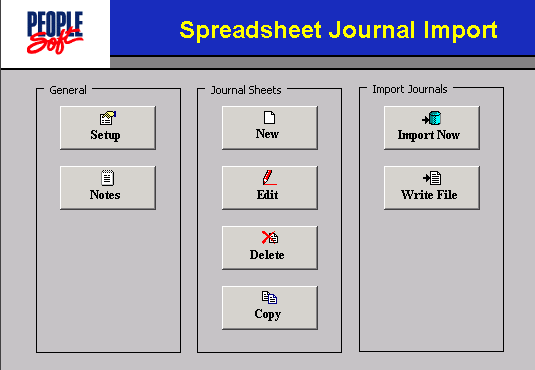 Navigate to Set Up Financials/Supply Chain > Common Definitions > Design ChartFields > Department. Add a new value. That’s it on Audit Records in PeopleSoft! « PeopleTools 8.53 Release Value Proposition » Process Remains in Posting State? I lost the audit link (in the step 6) in the base record property (tab Use) when migration from dev to test server. Could you help? While migrating the project from dev to tst, click the Options button in the Copy Database dialog. This will take you to the Upgrade Options settings. 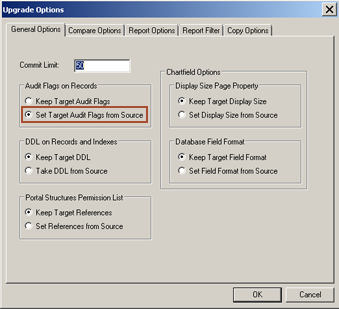 Here, on the General options tab, select the “Set Target Audit Flags from Source” option in the Audit Flags on Records settings. Click OK and proceed with the migration. This should hopefully solve your problem; please let us know if it worked. Is there a way where we can audit derived records? I have a situation where a users wants to audit when the National_Id change under Benefits–> Employee/Dependent Information Update Dependent/Beneficiary. I have looked at the field (NID_SPECIAL_CHAR) and the record is DERIVED_HR. I am not sure how to audit this one. We cannot audit work/derived records. you can track or capture the data when it reaches the main table [physical] from the derived record once the page is saved. I Created Audit record for PSOPRDEFN Table.If i changes perform any user profiles that changes are stored in audit record.But if i deleted any user profile the deleted details are not stored in audit record.How can i resolve this problem. There must be a row for deletion with action set to ‘D’. A possible lapse would be in the audit record mapping, check whether you had checked the “delete” check box. [step number : 6 in the above article]. We are in version 9.1. Will this work for our version? to also bring values to the audit query, when the main record is updated, which includes fields in its subrecord? 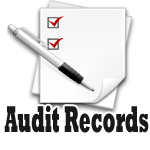 A Main Record with a sub-record embedded with it when audited captures both the fields of sub record and main record. Please let me know if your question is answered ? I have noticed that if I delete my audit record for my address data, then I get a sql error when I try to update/change the next vendor address record. Then I am unable to save the data. Is this one of the issues with creating these new audit records vs. just using delivered audit processes, which allows purging audit records? I am trying to audit for Profile Management–> Person profiles. Page contains the Sub Record Field. When I assign Audit record to JPM_JP_ITEMS and save the component. Only main record fields only storing in Audit not the sub Record Fields. Is the functionality would be like this? or am I missing some thing? In 9.1 we also have a delivered audit logging feature which can track most of the commonly used transaction tables. That would come in real handy, isn’t it? PS user defines audit record captures add/change/delete performed by the PIA online page. Does PS user defined audit record capture add/change/delete performed by AE, SQR, COBOL? Perhaps you meant remove any additional keys beyond those three fields? Thanks for pointing it out, clark ‘the dragon’ willis! We were able to find delivered audit records which did not have these fields marked as keys. That said, I’ve changed the text to be inline with what PeopleBooks recommend.